Maybe I had never really had good ones or maybe it just took awhile for me to be able to appreciate their delicate, sweetness. Either way, in the past few years I have become a big fan. Last summer I ate so many blueberries (and sweet cherries) that I’m pretty sure my skin took on a pale purple tinge. Tim laughs at my food obsessions. (I have a similar love of grapes.) Once I love something, I really LOVE it! Lucky him! I am still trying to love sweet potatoes. I don’t loathe them the way I used to. And I’m trying to get a feel for eggplant, too. This cake takes the best part of a pie, the crust, and pairs it with a yummy blueberry cake and rich blueberry buttercream icing. 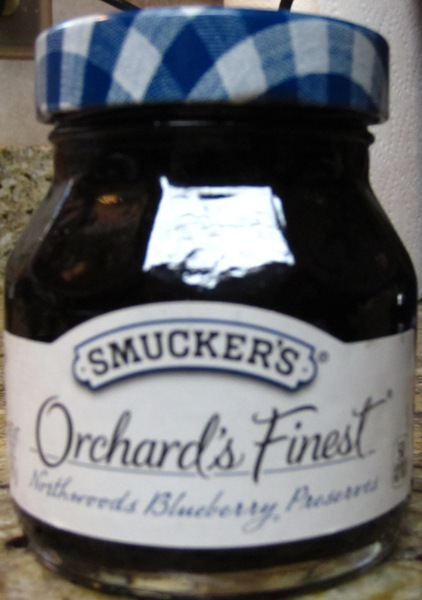 Mostly I prefer plain ole’ fresh blueberries, untainted by surrounding muffins or pancakes. I don’t really like blueberry muffins or pancakes. Blueberry baked goods in general are not my first pick. I think we’ve already established however, that there are (sometimes huge) exceptions to my food “rules”. I can make an exception from time to time. . like this cake. When Tim and I were dating he used to get up in the morning and make me blueberry pancakes. I would swoon at how sweet and doting he was. . .and then quietly choke down blueberry pancakes as though I thought they were fantastic. I did finally tell him I wasn’t a fan, saving myself from eating anymore of them. . .and probably crushing him in the process. My lack of love for the blueberry pancake did not deter him though, (he married me anyway) and these days for breakfast he makes me the worlds best espresso and also egg and cheese sandwiches. Sweet and doting as always. The graham cracker crust is the secret to this cake. Go figure. Graham cracker crust is pretty much always yummy. 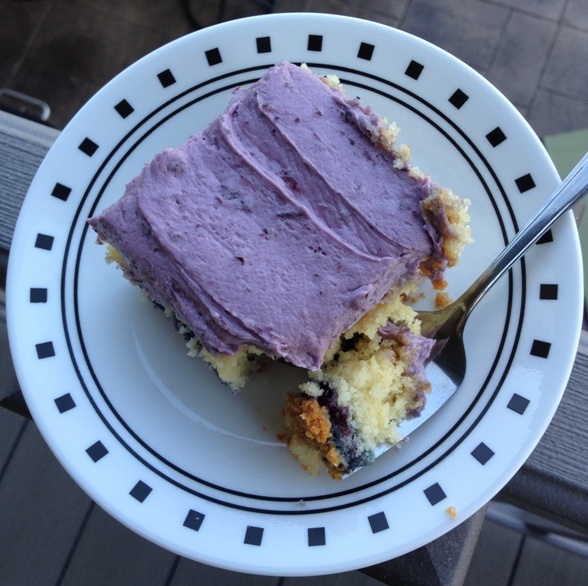 I did coat my blueberries with a dusting of flour before I mixed them into the cake batter so they would not sink to the bottom of the cake. But guess what? They sank to the bottom anyway. It was still delicious. 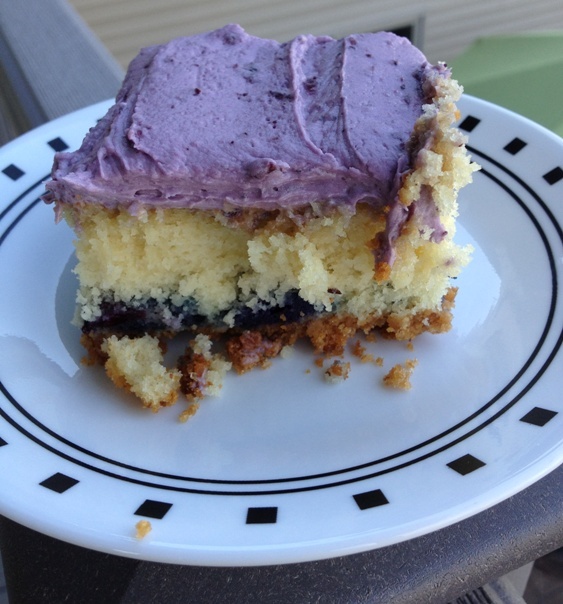 I’m sure you could probably use fresh blueberries in the icing but I prefer to use preserves as the flavoring for buttercream a lot of the time. 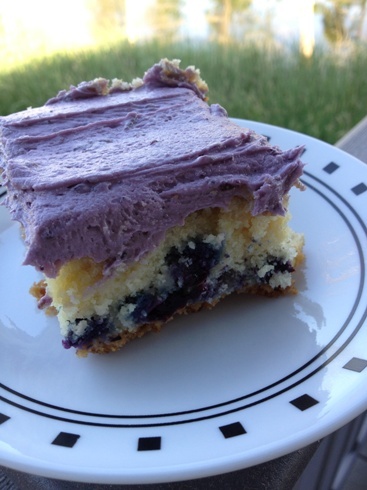 Even if you aren’t a blueberry fan you should let this cake be the exception to your rule. I was told by my cousin that she liked this cake even though she did not like blueberries. By the way, despite my love of any particular fruit or veg, I will not buy it unless it is in season and of a reasonable price. 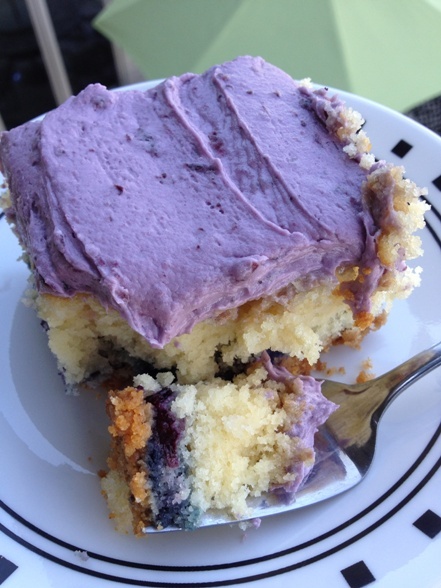 Now is the time to think about making this cake as blueberries come into season. You have a small window! Cream together butter and sugar until light and fluffy. Takes about 4-5 minutes. Beat in the vanilla, egg whites, milk. Combine well. Add 2 cups flour, salt, baking powder and mix until combine. Set batter aside. In a bowl mix the blueberries with 2 Tbsp of flour and toss to coat berries. 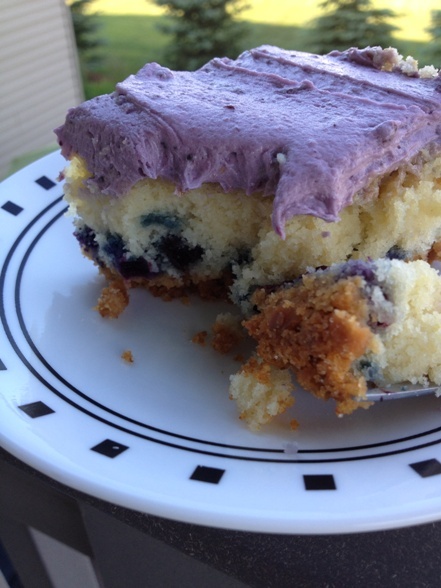 Stir coated blueberries into the batter. Pour the batter over the graham cracker crust and spread to evenly cover the crust. Bake at 350 degrees for 45 minutes. Allow to cool completely before icing. Cream together butter and blueberry preserves. Add salt and vanilla. Slowly add the powdered sugar one cup at a time until light and fluffy. Leftover icing can be frozen for a few months.